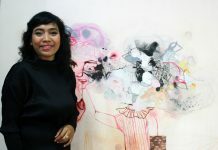 Born in Tebesaya – Ubud in 1966, Sena started to paint seriously since he was 23, after learning the skill from his father, Ida Bagus Wiri, a Pita Maha alumnus and from his famous uncle, Ida Bagus Made (Poleng). Previously, he almost considered of taking chemistry as his further study but due to the financial difficulty, he dropped his idea. Sena’s works are very intricate and rich in history and details, mostly dominated with earth colors. His first painting was about barong. For few years he had been painting barongs only, until he was recognized as the barong master painter. 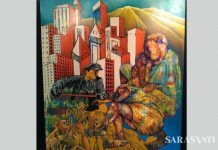 However, in his recent works Sena has been trying to depict social issues and criticism, this can be seen in his paintings such as: Raja Bedahulu, Soemantri-Sukrasena, andRuntuhnya Dalem Balingkang. Being so deeply rooted with Hindu and Balinese philosophy, his works are always talking about morality in the society. The originality of ideas for his paintings is remarkable, and these ideas are just flowing freely without any restriction. Ida Bagus Putu Sena lives with his family in a family compound in a simple house, with his working studio just beside it. He doesn’t know how to drive a car or how to ride a motorcycle or bicycle. When he needs inspiration for his painting, he will just walk as far as his feet can get him to, or he will take a public transport. It is quite unusual for a Balinese if he or she doesn’t know how to ride a motorcycle, because even a 12-year-old young boy is good at it. 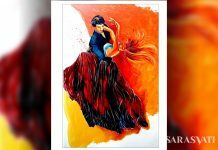 Previously painting in small size canvases, nowadays Sena has more courage to express himself in medium and large canvases. Nevertheless, he still puts his heart into details. His works had been collected by most prominent collectors in Indonesia and overseas, even the museums. It is not an easy task to acquire Sena’s art works. Due to the degree of its intricate details, he can only produce two paintings in a year. Anybody who likes to collect his painting have to wait for a long time, and even after that, Sena may not want to let his painting owned by the person, if he finds him not sincere enough in collecting it.